This article first appeared in the Rushville Republican on February 27, 2017. Experiencing the end of life is a time of decisions, comforting, and care for loved ones. In the past choices were limited to where families and patients could be placed in hospice care. Rush Memorial Hospital began working with Premier Hospice of Carmel to provide hospice care on the Med/Surg floor of Rush Memorial Hospital. The partnership has been so successful that Rush Memorial now provides in house hospice care to patients in need. Beginning in late 2014 patients now can experience end of life in a setting that provides the best care for their needs right here at home. When symptoms become unmanageable at home the patient may be admitted to RMH Hospice Care and have medical assistance to care for their needs. The RMH Hospice program has been so successful that they have received the Premier Hospice Bridge Award for excellence and commitment to end of life care. Vice President of Nursing, Carrie Tressler and RMH Hospice Coordinator Janie Manning received the award on behalf of the hospice staff and hospital. The RMH Foundation in response to family requests has created the RMH Hospice Fund. The purpose of the fund is to give grateful families and our community a way to honor the care received in RMH Hospice. These tax deductible gifts will in turn be used for needs in the RMH Hospice rooms and areas. Recently, a family lounge room has been prepared for families to have a quiet and private place to go. Needs specifically to hospice patient’s families will be considered in the future as the RMH Hospice area expands. Gifts can be made at any time to the RMH Foundation at 1300 North Main Street, P.O. Box 215, Rushville, Indiana 46173. If writing a check please write on your memo line: RMH Hospice Fund. 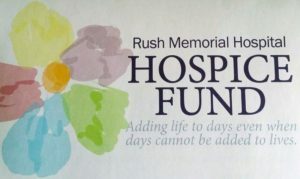 Gifts may also be given online at www.rushmemorialhospitalfoundation.com. This is an opportunity to make a real impact in the lives of hospice patients and families when dealing with end of life circumstances. You gifts do make a difference. Please consider a tax deductible gift today. For additional information contact Faith Mock, RMH Foundation Director, at 765-932-7568.